This is the view from my laptop, sitting at the dining table, looking past the living room space and out the nearly floor to ceiling window. The dishes are washed except for the plate from, um, let's call it "lunch," I just ate, a cup of Pukka Revitalise tea, one fork, one knife. If you know me, then you know it was actually breakfast and, no, I didn't misspell revitalize, it's the name of the tea. Really. This has been a nice three day writing retreat. And while I didn't accomplish everything I thought I would, I was on the phone last night with S who reminded me that I do tend to plan more than I can realistically do. She's right even though I started to protest, but only for the briefest second. Because. I know she's right. The sheets and towels and my dirty clothes are in the dryer now. I hear them going round and round and the rhythm is familiar. And one benefit of having a place to go to sometimes which is not a hotel is that I can take my time in leaving and I can wash my clothes along with the things I have to do as a participant in this place, so I can go home with clean clothes instead of one more thing to do when I return to my everyday life. 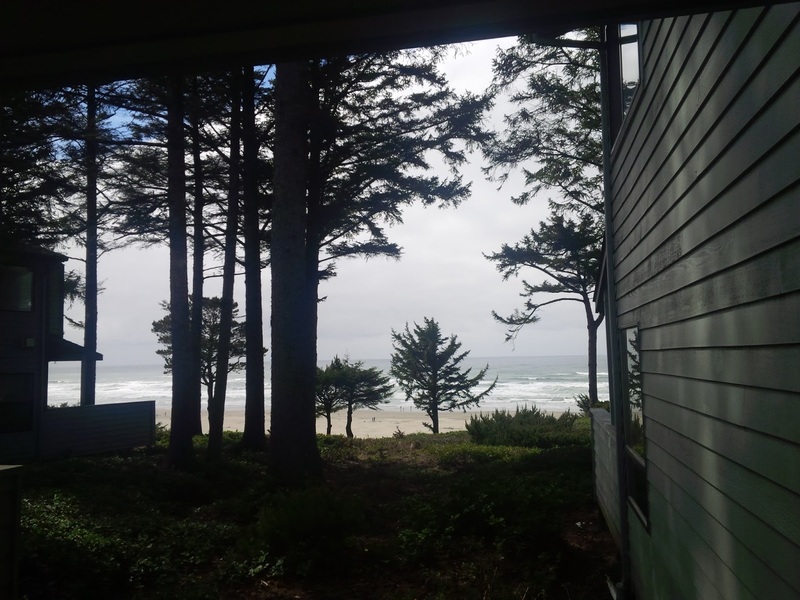 In these three days with this view and the ocean and time and nowhere to be at any specific time, I have accomplished some writing. The biggest thing I needed to do was to complete and submit a piece of writing for a workshop I'm attending in early May. The piece was edited and submitted; check. Then I wanted to work on something for my newly formed critique group: I have to submit up to 2000 words by next Friday; semi-check. I wrote some new material and paired it with a piece of the manuscript and wove the two together - that's the "check." The "semi" part is that I still need to do some editing and work on the continuity of voice and tone and pacing before I send it in. But the hard part is done, I think. So I can probably call the critique group submission a "check, part one." While the dryer cycles its contents to dry and I finish the last of the tea, I am trying to just be here. No specific time to depart. No specific time I have to be home. Trying to be present as long as it lasts. And maybe I'll write a bit more before I go.